The fascinating history of humanity. The Life of an Israeli Secret-Agent who became one of Hollywoods biggest Producers. An educational dictionary for children of ages 1 - 4. 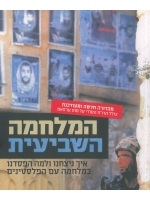 This is the Hebrew Edition of the controversial book by Avraham Burg, former Knesset speaker, head of the Jewish Agency, and son of Yosef Burg, Stalwart of religious Zionism in Israel for decades. The exciting and controversial life of Ariel (Arik)Sharon is told by two veteran israeli journalists. Contains photographs from as late as the Summer of 2005. A best-seller in Israel, Tefillat Nashim is a book about and containing both old and new prayers for Jewish women. Former Chief Rabbi Yisrael Lau had this book published on the occasion of the 60th anniversary of liberation of the Buchenwald concentration camp. Soul Prints is a ground-breaking work of New-Age psychology and spiritualism. Hamilchama Hasheviit. Eich Nitzachnu? Lama Hifsadnu Bamilchama Neged Hafalestinayim? How we won and why we lost.